The Sölden Snow reservoir in the ski resort of Sölden, Tyrol in Austria was built to store water to supply snow cannons for the production of artiﬁcial snow. At an altitude of approx 2,930m above sea level, close to a glacier, it has a usable storage volume of some 400,000m3. To prevent the loss of water through leaks and damage due to weathering in extreme temperatures, the most impermeable, strongest, yet still flexible liner possible was required and so WALO was commissioned to line the reservoir with its specially formulated Dense Asphaltic Concrete (DAC). The construction schedule had to be very ﬂexible, owing to the changing weather conditions at such high altitudes. Even in the summer, more than two meters of snow fell at the site. The nature of the site, located in an area popular with winter skiers and summer hikers meant that the reservoir needed to blend in with its environment as far as possible. The formation level of the slopes was covered by a drainage gravel layer placed by paver. The complete surface of the reservoir was then surfaced with a Asphaltic Binder Layer (ABL), Dense Asphaltic Concrete (DAC) layer and a mastic coat. The surrounding top ﬁve meters of the slope were covered with local stone chippings rolled into the mastic layer to help the reservoir blend into the natural environment and give it a ‘natural’ ﬁnish. 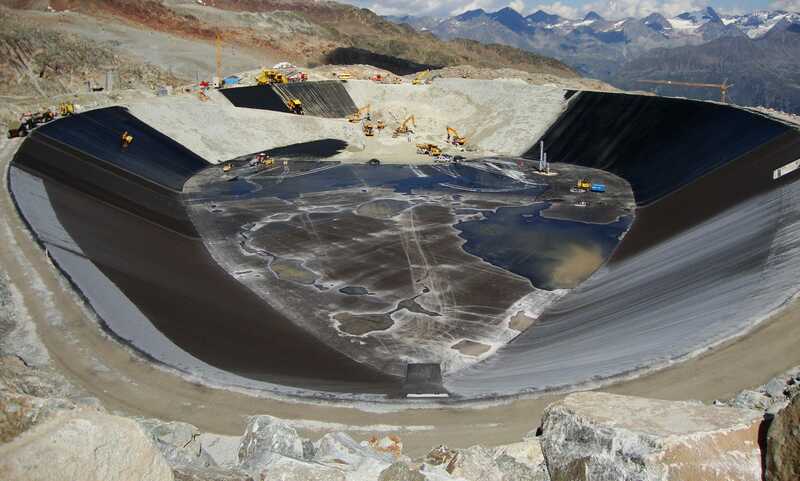 The dedicated WALO team’s experience of working with highly specialized equipment at high altitudes in all kinds of weather, meant that the asphalt lining works ﬁnished on time after an intensive four month period where 55,000m2 of ABL and DAC were laid, despite the climatic challenges.